Best Boiler Voted By 600 Gas Engineers - See Survey Winners! We get asked the same question at least once a day: What is the best boiler on the market? So, we decided to conduct, perhaps the largest, engineer survey of it’s kind to give you the definitive answer to which is the best boiler – according to the engineers that fit, repair and service them day in and day out. We asked 74,000 registered Gas Safe businesses to take part in this comprehensive survey. Six hundred (600) Gas Safe registered businesses replied to our survey. We verified all their registrations and ID numbers and only let each business have ‘one vote’. As you can imagine, this can cause quite a heated debate when two engineers get together down the pub for a pint. They will invariably discuss the pros and cons of each boiler they work on and favour one over the other. Some engineers will be loyal to one brand, others will fit what the customer asks them to fit, or what’s on offer at the local merchant. So, what did we ask and how did we go about finding the definitive answer to what the best boiler is? As you can imagine with such a mammoth task, we had to divide the questions into sections. We asked about which manufacturer offered the best support and service. 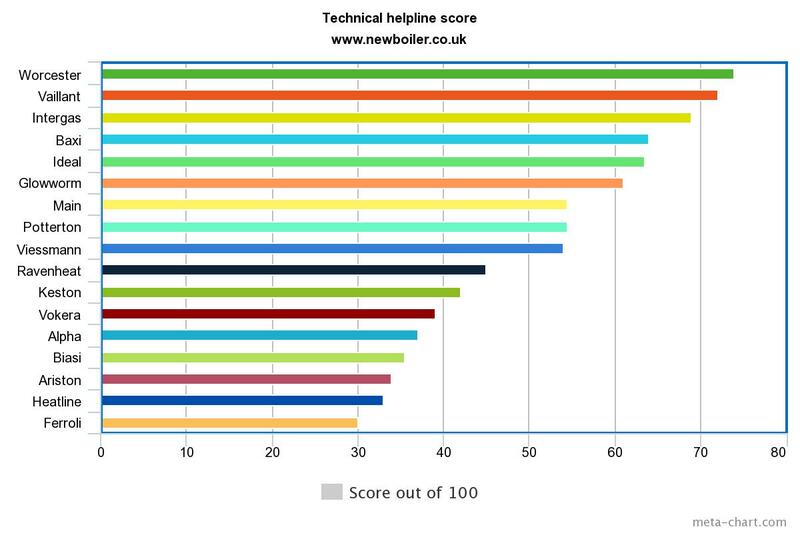 We asked whether technical helplines were actually helpful. Then we asked more in-depth questions about combi boilers, regular boilers, and system boilers. In these sections, the Gas Safe registered engineers were asked their opinion about the ease of installation, build quality, how easy the boiler was to service and further questions including how easy it is to source parts. All engineers had to have worked on the boiler in the last 12 months. The findings come from 600 verified engineers freely giving their advice and insights from working on a wide range of boilers from all the leading manufacturers. Finally, we asked which boiler they would recommend for 3 different budgets – small, medium and money no object – for combi, regular and system boiler installations. The results are very revealing and eye-opening, even for a time-served engineer like me. OK, let’s get on with the survey results. How many boilers did you install in the last 12 months? 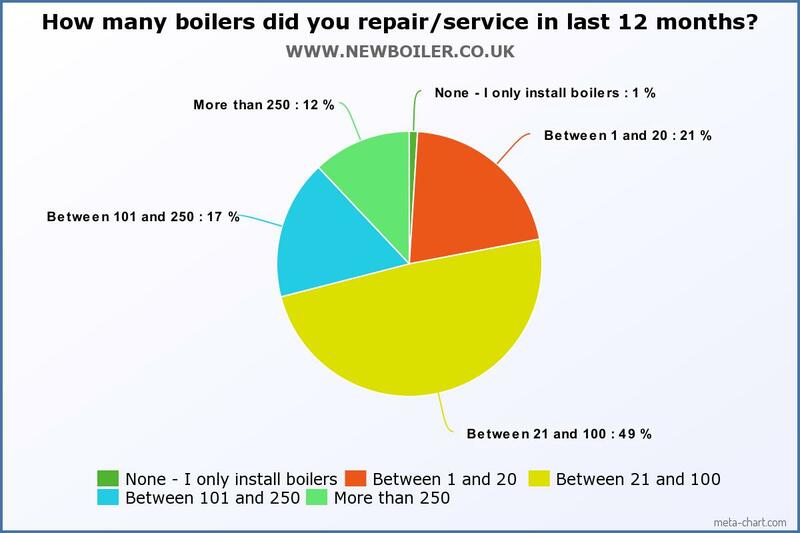 As you can see, very few respondents (less than 1%) only service or repair boilers and haven’t done any kind of installation work in the last 12 months. 80% of installers have fitted between 5 and 50 boilers, with the largest segment surveyed fitting between 11 and 25. A hardworking 3% managed to install more than 100 boilers in the previous 12 months. 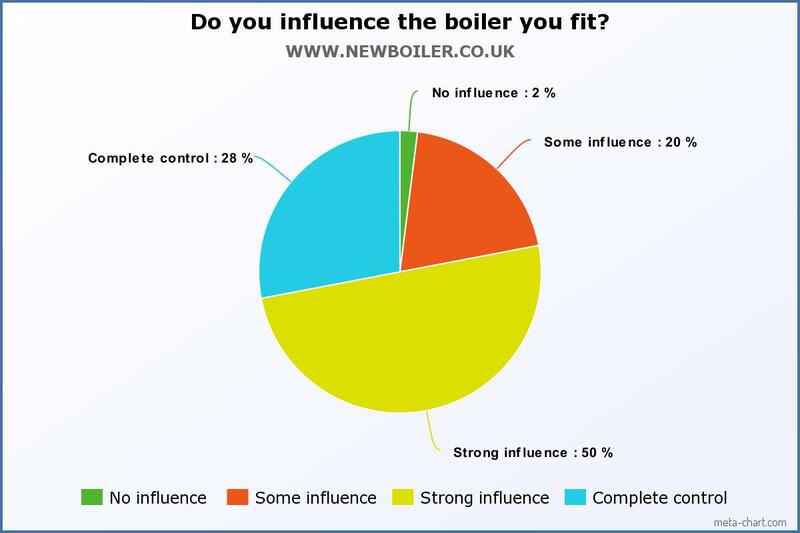 How much influence do you have in choosing the boiler you install? The results for this were as expected really. Customers generally trust the engineers choice of boiler with 78% having either a strong influence or complete control over which boiler to install. 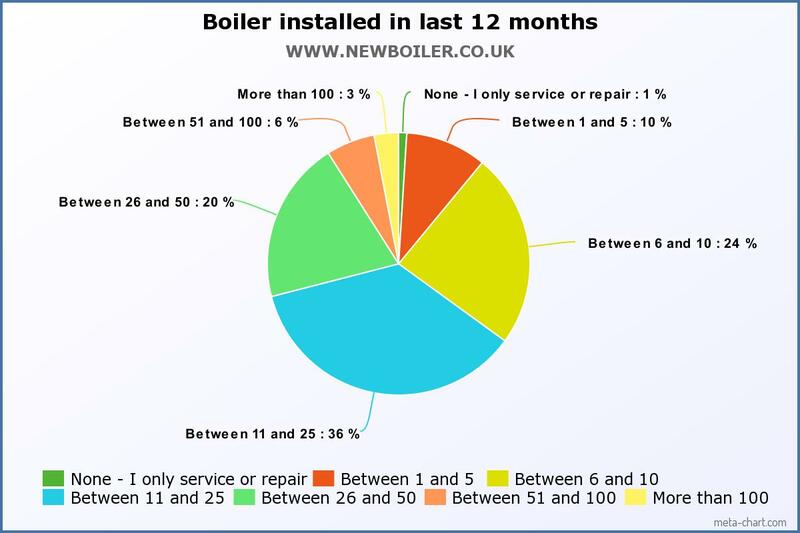 How many boilers did you repair or service in the last 12 months? Again, less than 1% of engineers stick to one aspect of the job. The other 99% repair, service, and install boilers. A large number (29%) repaired or serviced at least 101 boilers in the last 12 months. In this section, we asked engineers to rate the manufacturer on their pre-sales service (literature, advice, help from representative) and after sales care (warranty callouts, and technical helplines when diagnosing a fault). If a manufacturer isn’t present it just means we didn’t have enough data to make a representation. Worcester and Vaillant leading the way here but only just. Intergas and Ideal are following very close. A high after sales service score is very important as it includes warranty call outs and sales and technical representatives helping out when needed. 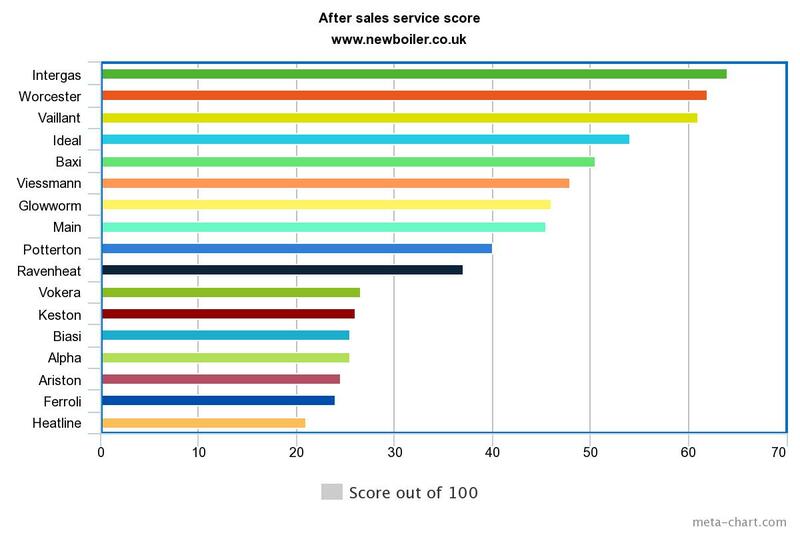 Intergas lead the way here with a 64% satisfaction score ahead of Worcester and Vaillant. As expected, this category was lead by Worcester and Vaillant. I would agree with the assessment that both Worcester and Vaillant are excellent when it comes to technical issues and their helpline staff are clearly very well trained and can offer a lot of expertise on the end of a phone line. 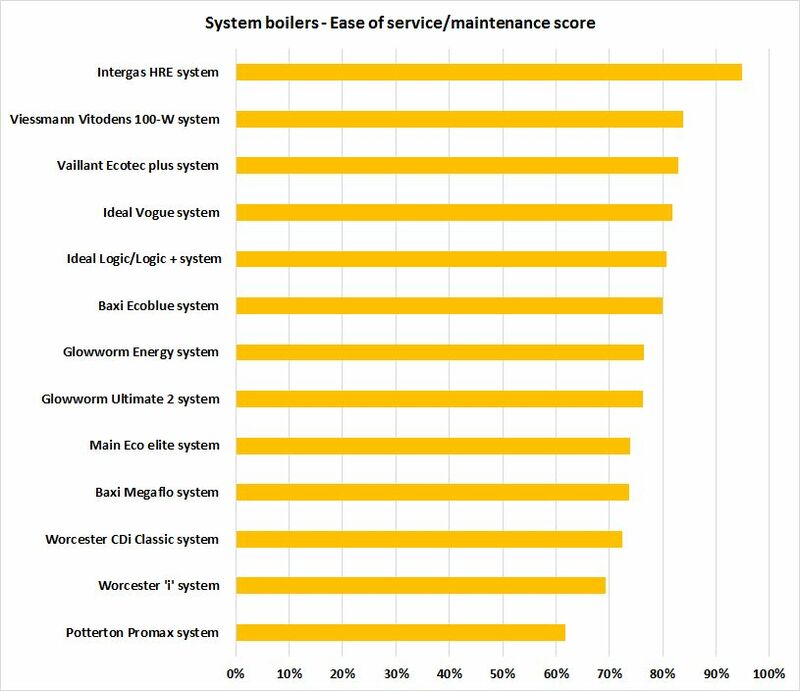 Intergas, a very new entrant into the UK boiler market (and untested so far by our company), came in a very respectful 3rd with a 69% score. As far as pre-sales, after-sales, and technical helplines go there was very little change to the top 10 each time. Worcester, Vaillant and Intergas took the first 3 places in all categories. The best of the rest were Ideal, Baxi and Glowworm who came in at an average of 4th, 5th, and 6th respectively. The rest, headed up by Ravenheat, were a long way behind with expected lower scores. We asked engineers for their comments and we got quite a few responses for all manufacturers with the most common being ‘waiting too long to get through’ and being ‘charged premium rates whilst being on hold for long periods’. One respondent stated ‘they need more tech staff or need to use free phone lines’. After-sales support, in general, was not as high as it could have been with Intergas scoring the highest at 64%. In this section, we asked each engineer which boiler they would recommend to a family member based on three different budgets: small, medium and money no object. No surprise here really. 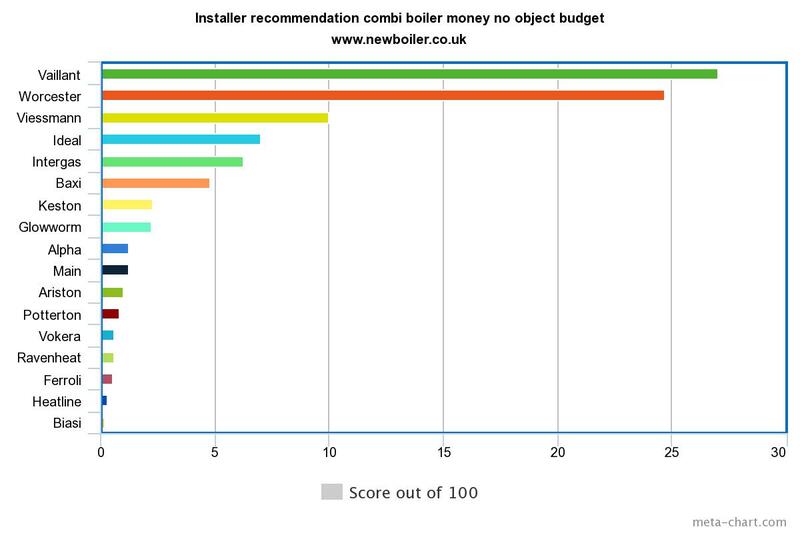 Our preferred choice for customers on a budget is the Ideal range of boilers and it seems like 9.1 engineers agree. Main came a very close 2nd followed by Heatline in 3rd – another of our preferred choice of boiler manufacturer. 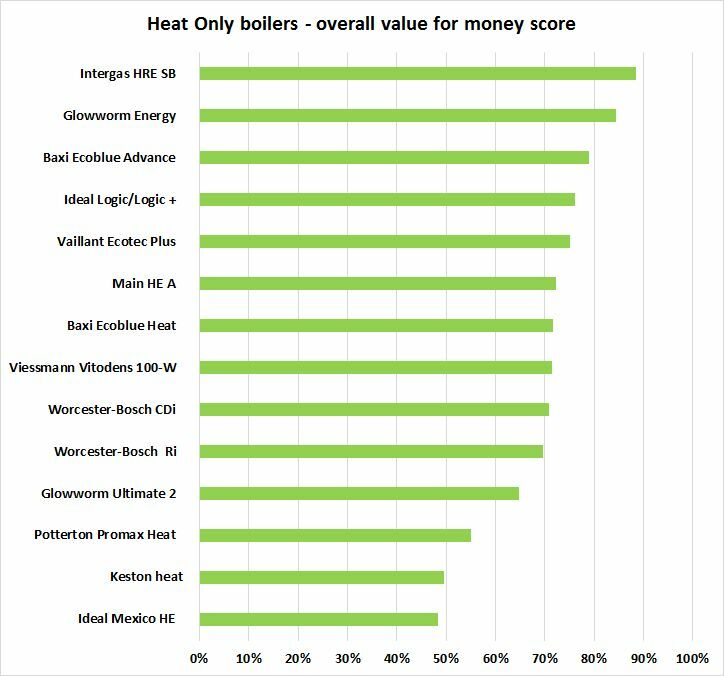 Glowworm and Ravenheat (boilers that we wouldn’t personally recommend) came in 4th and 5th respectively – so well done there. 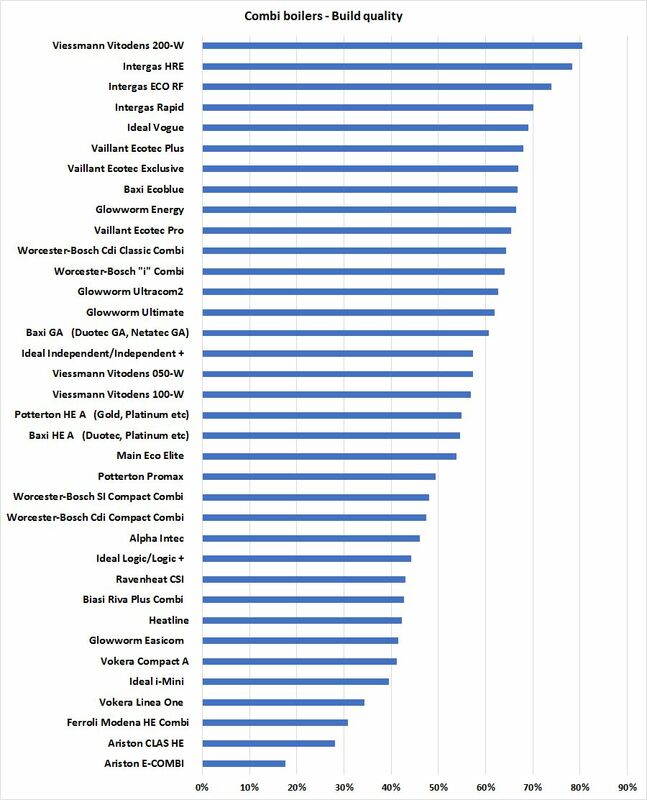 The more expensive boilers such as Vaillant, Viessmann and Worcester trailed behind lower down on the list – mainly due to their premium price, of course. Ideal are the runaway leaders in engineers choice for best boiler on a medium budget. This result was also expected, considering how good Ideal’s new range of boilers is, not to mention the extended warranties they now offer. 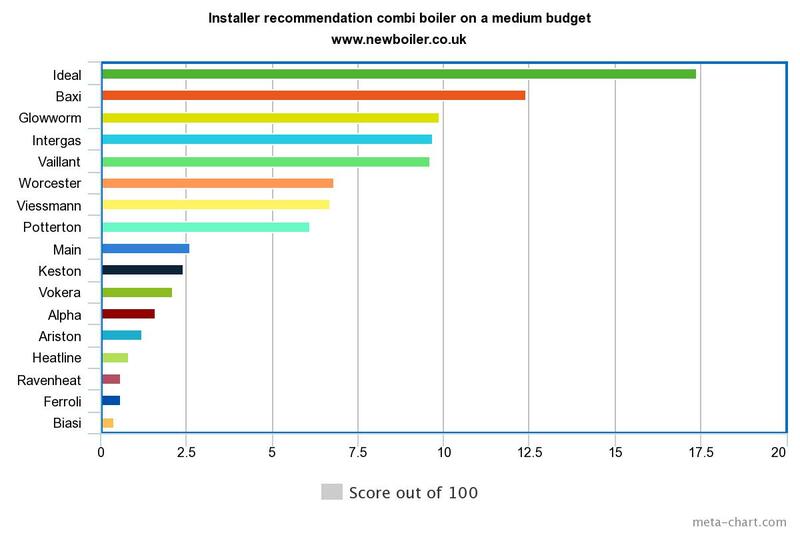 I think this survey validates our decision to recommend Heatline and Ideal boilers to our customers on a tight budget. We also offer Worcester and Vaillant to complete our full range of boiler offerings. Baxi took second place behind Ideal and ahead of Glowworm in 3rd. Intergas, Vaillant, and Worcester took 4th, 5th, and 6th respectively. After 6th place, there’s quite a bit of drop off with the remaining boilers only making up a total of 11% of the combined vote. In my opinion, there’s no surprise here. I guessed Vaillant and Worcester would come out on top in that order. Between them they have claimed more than 50% of the votes. I think it depends on your individual preference for which model you want based on past ownership that will determine which one out of these two boilers you’ll want installing. For me, there’s no difference in quality, reliability, and aftercare between these two boiler brands and we cannot recommend one over the other. Vaillant scores a huge 24.7% score with Worcester coming second with 24.7% of the votes. 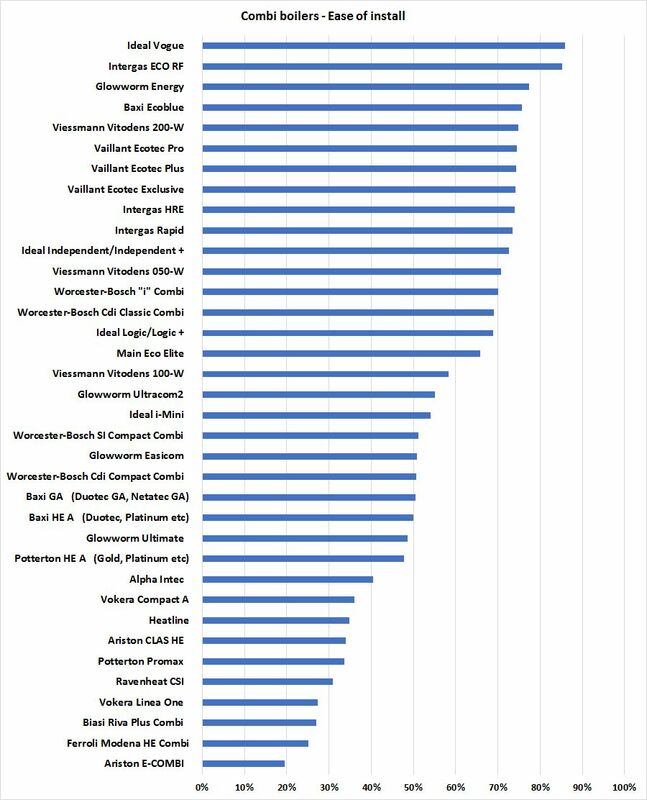 My only slight surprise was that Viessmann was not closer to the top two, it’s a very good German boiler. Atag in 4th is also a very good boiler with only 4 moving parts. It’s very much liked by engineers because it’s easy to install and service but, because it’s so new to the UK market, reliability isn’t proven just yet. 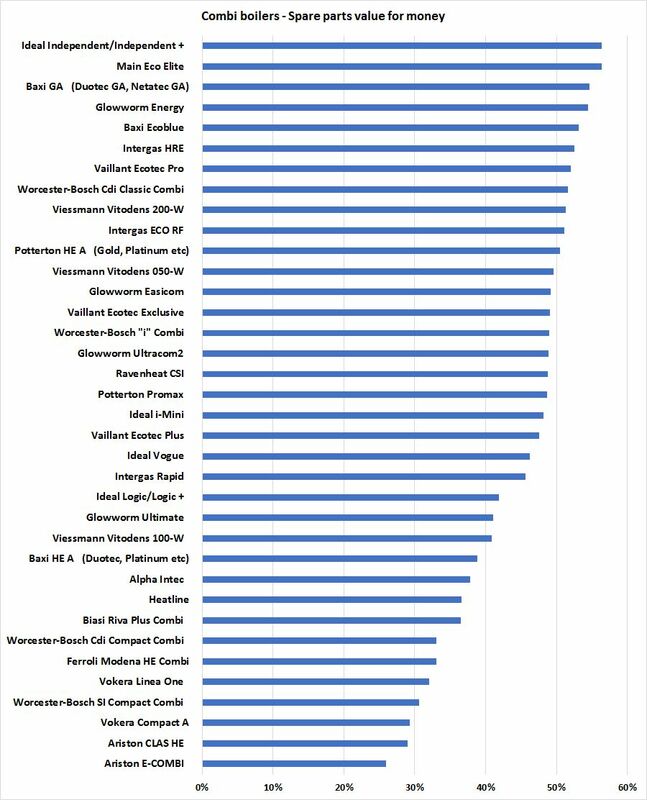 It’s worth noting that out of the top 3 scoring boilers (Vaillant, Worcester, and Viessman) the cheaper of the boilers is very much Vaillant’s brand of boiler. Vaillant also has regular installer offers that engineers sometimes pass on to their customers – so it’s worth asking. Next, we asked questions on individual boilers that could help to back up the findings for combi boiler recommendations. It also helps us to determine which aspects of a boiler the engineer likes. Bear in mind again, the engineer will had to have worked on the boiler in the last 12 months in order to qualify to give their opinion and vote. The following questions were marked by engineers out of a maximum 5 points and then converted into a percentage, and an average taken. The higher the percentage, the better the boiler in that category. There is a very large amount of boiler models on the market, so if a manufacturer isn’t present it just means we didn’t have enough data to make a representation. Leading the way in this category was the Ideal Vogue and the Intergas ECO RF. Those that installed these boilers on a regular basis thought they were easy to install and gave them very high scores, 86% and 85% respectively. The Glowworm Energy boiler came in a very respectful 3rd place. Interestingly, Vaillant’s 3 models scored within 0.2% of each other, with their entry level Ecotec Pro scoring the highest. 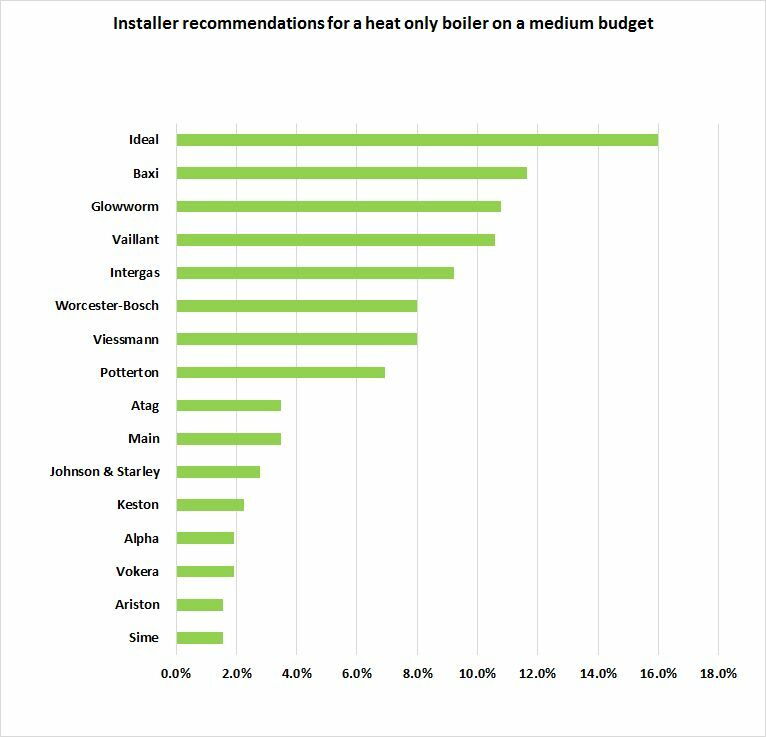 Notably, only Vaillant and Intergas have all three of their models in the top 10 easiest to install combi boiler category. 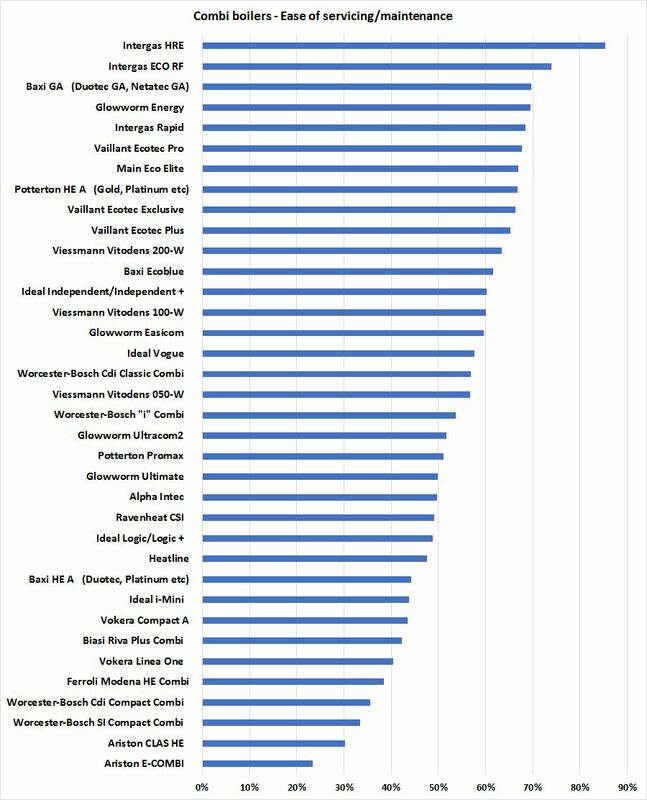 Again, Vaillant and Intergas have all 3 of their models in the top 10, this time for build quality. 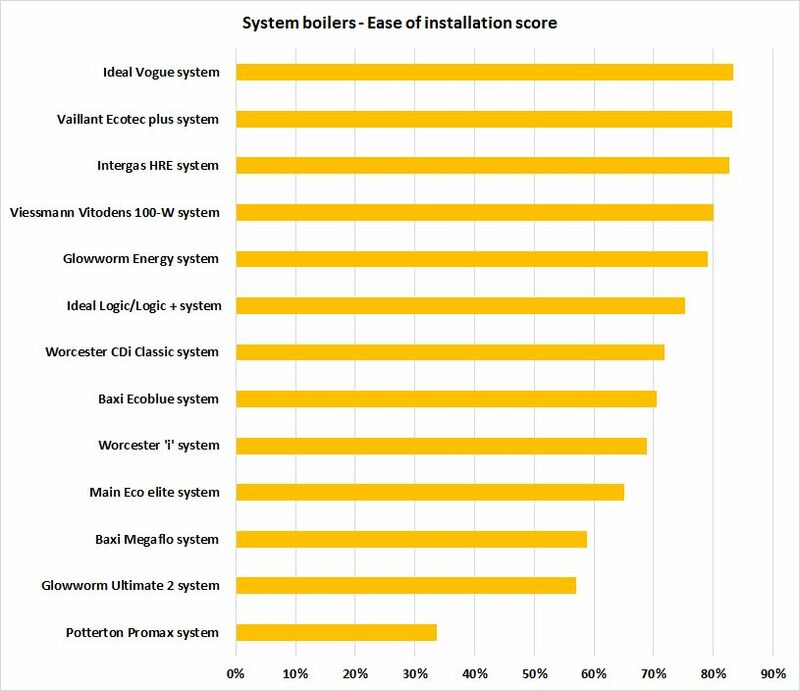 This time the Viessmann 200-W takes the top spot with a score of 80%. 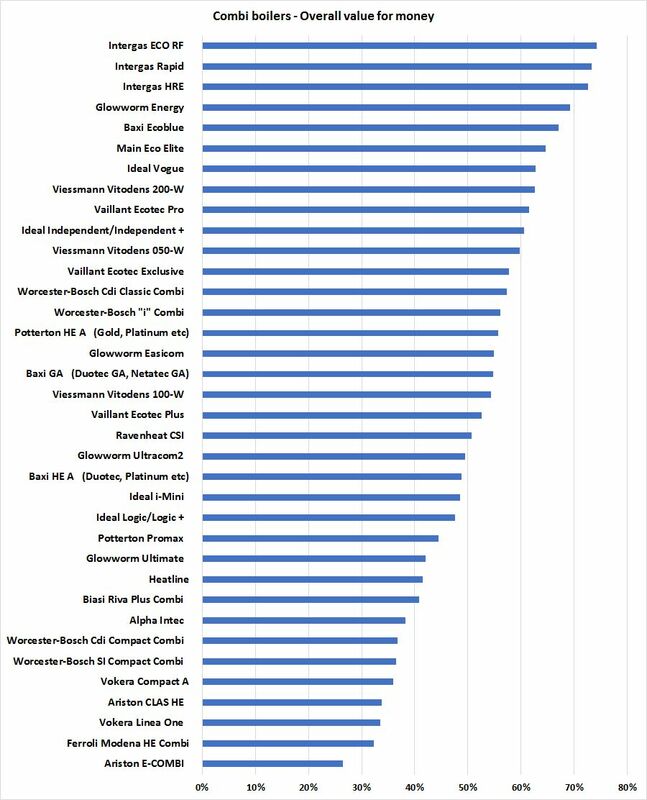 Intergas this time takes 2nd, 3rd, and 4th spot with its combi range. I only install the more reliable boilers, but I have had to repair/service the lower end boilers, and their build quality and reliability don’t inspire confidence. Above, an interesting comment from one of the engineers who voted in our survey. The Intergas boilers scored highly in this section, as expected. Servicing a boiler with only 4 moving parts is going to be easy I guess. The HRE model scored an amazing 85%. Engineers sure do love servicing them. And of course, they’re pretty easy to repair when they break down as well. 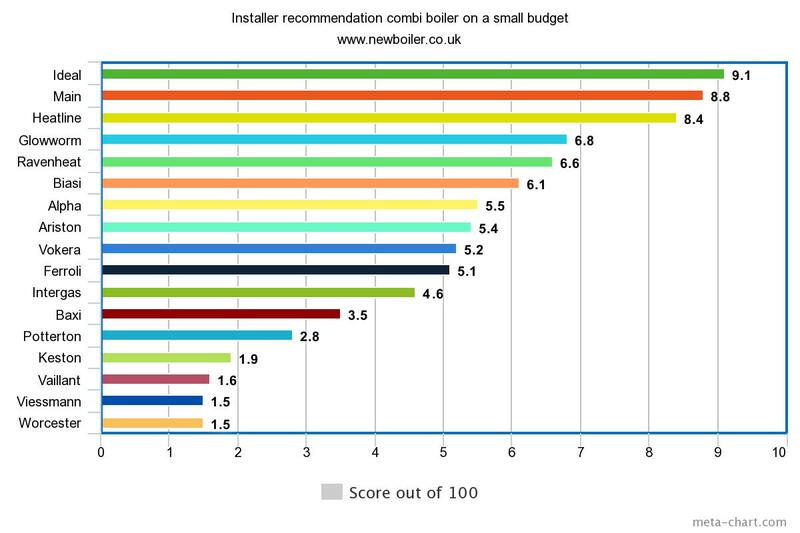 Once again, Vaillant and Intergas have all their combi boiler models in the top 10. It can be noted that, generally, the scores for availability of spare parts are lower than the other categories in this section. I think manufacturers sometimes make it hard for engineers to source parts cheaply. This effectively makes them too expensive for the engineer. They cannot compete and the manufacturer gets paid for the call out instead – making huge price mark-ups whilst doing so. I think this proves my earlier point about manufacturers having a monopoly on parts and almost charging what they want. The lowest scores yet in this category. I was recently asked to attend a breakdown on a Worcester combi boiler where the PCB needed replacing. A new PCB was sourced for £212 including VAT. I told the customer that it would cost £90 for me to replace it but Worcester themselves offered a fixed price boiler repair for £210 including VAT. So it would be best to use them. Anyway, our next question was based on best combi boiler overall value. 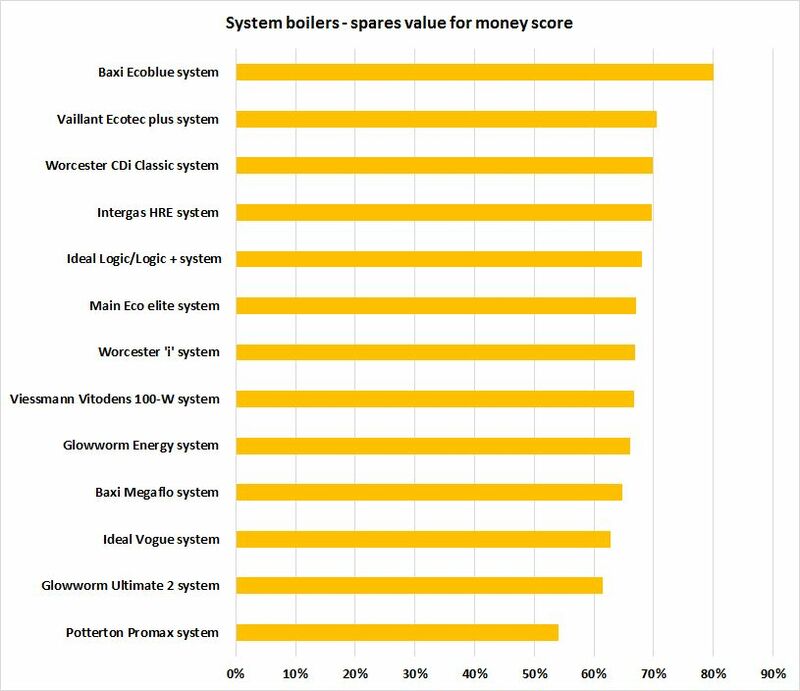 We asked what the best boiler was based on price, quality, warranty and any other factor they thought was important. Wow, Intergas took 1st, 2nd, and 3rd for this category sweeping aside the others. The Glowworm Energy and Baxi Ecoblue were a few points behind. 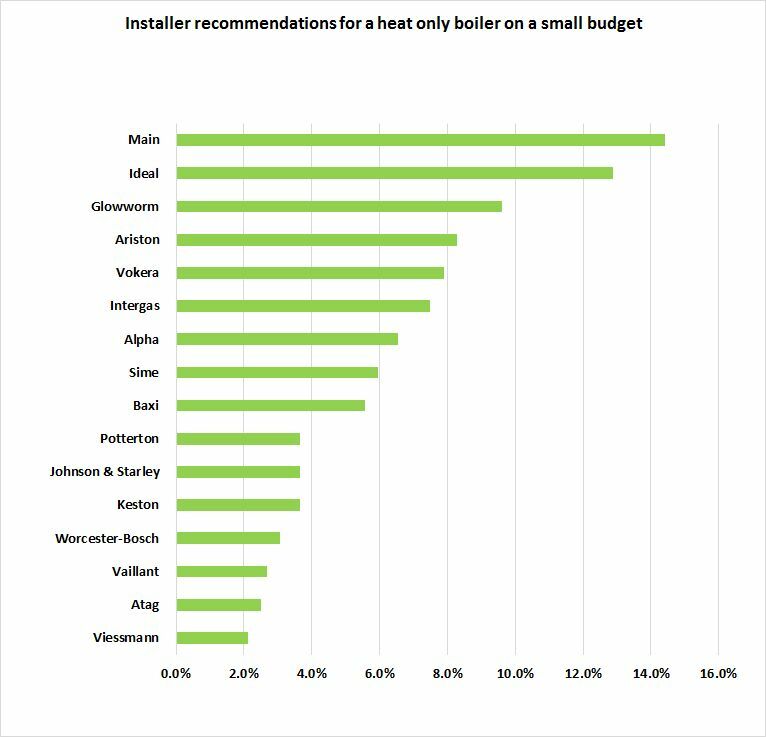 In this section, we’ll look at what engineers would recommend for heat only boilers based on 3 different budgets – small, medium and money no object. Heat only (also known as regular or open vent) aren’t as common as combi boilers but they are very much suited to larger properties. Main (Main HE A range) and Ideal (Ideal Logic) are the clear runaway leaders in this category with Main taking 1st with a score of 14.4%. Ideal scored a very respectable 12.9% of the votes. The Glowworm Energy range comes in 3rd for this category. Next, we look at engineer recommendations for a heat only boiler on a medium budget. Again we see Ideal right up there, this time a clear winner with their Ideal Logic+ range. The manufacturer takes top billing with 16% of all votes cast to win the category best heat only boiler on a medium budget. Notably Main drops down the rankings this time. The Baxi Ecoblue (12%) just pips the Glowworm Energy into second position, which in turn pips the Vaillant Ecotec Plus model into third. Intergas makes an appearance in this category having missed out in the small budget category. 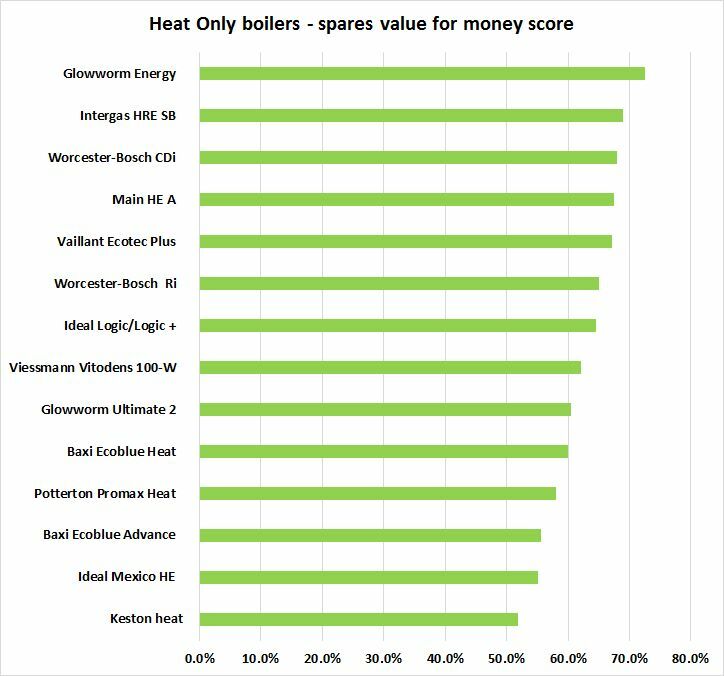 At the top end of the market, the clear winners were Worcester and Vaillant with their heat only boilers recommended by engineers if money was no object. Worcester’s winner was the CDI model with the Vaillant’s Ecotec Plus model coming in a very close 2nd. Again, it would just come down to personal preference which manufacturer you went for here. 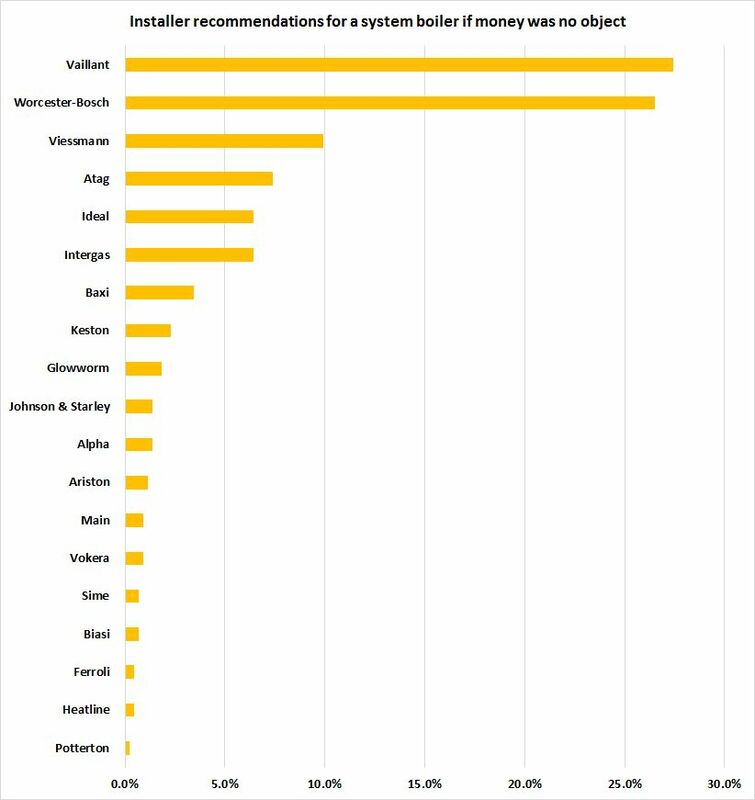 Both Worcester and Vaillant came together here to account for 57% of the total votes. Viessmann took 3rd with 9% and newcomer to the UK market Atag, took 4th with 7%. Next, we asked questions on individual boilers that could help to back up the findings for heat only boiler recommendations. It also helps us to determine which aspects of a boiler the engineer likes. The Intergas HRE range of heat only boilers was the best in this category – engineers like this boiler because it’s easy to install. It scored a massive 89%. Baxi came in second by only 2% with 87%. 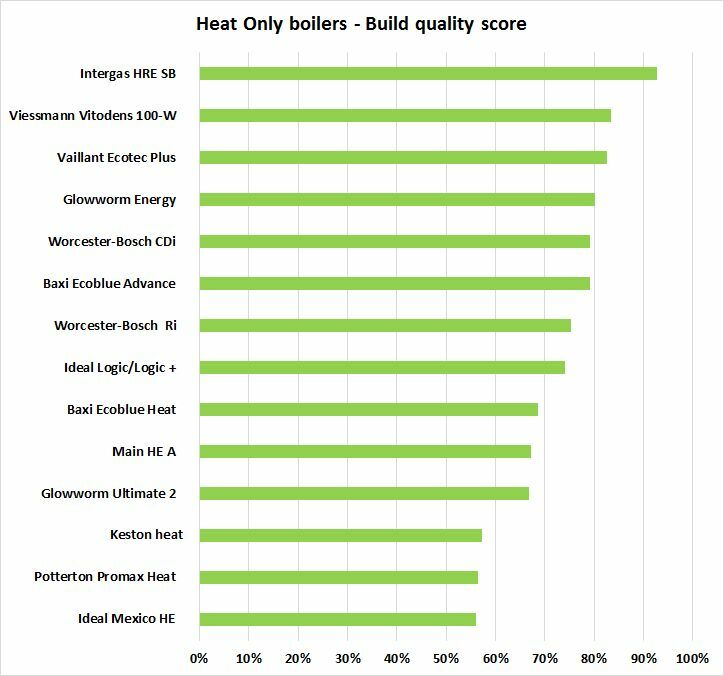 Just a few percentage points behind were Vaillant’s and Glowworm’s heat only boiler models. The next 3 boilers were equally rated but then we see a sharp drop off for recommended boilers. This category, the build quality score, goes to Intergas. By now we have lots of evidence that these boilers are very well built. The Intergas HRE SB got a gigantic 93% score, 10% points in front of a very well made Viessmann Vitodens 100-W boiler. After this, the Glowworm Energy, Worcester CDi, and Baxi Ecoblue head up the list with approximately 79% average score. Another 93% score and again it goes to Intergas. This time Vaillant (84%) and Viessmann (82%) swap places for 2nd and 3rd place. Glowworm also does well in this category with 4th and 6th for their models. Ideal’s Logic model is still hovering mid-table. For availability of parts, Worcester’s CDI range take first place scoring 85%. It’s close rival, the Vaillant Ecotec Plus takes second place on 84%. Worcester also takes 3rd place with their Ri range of heat only boilers. 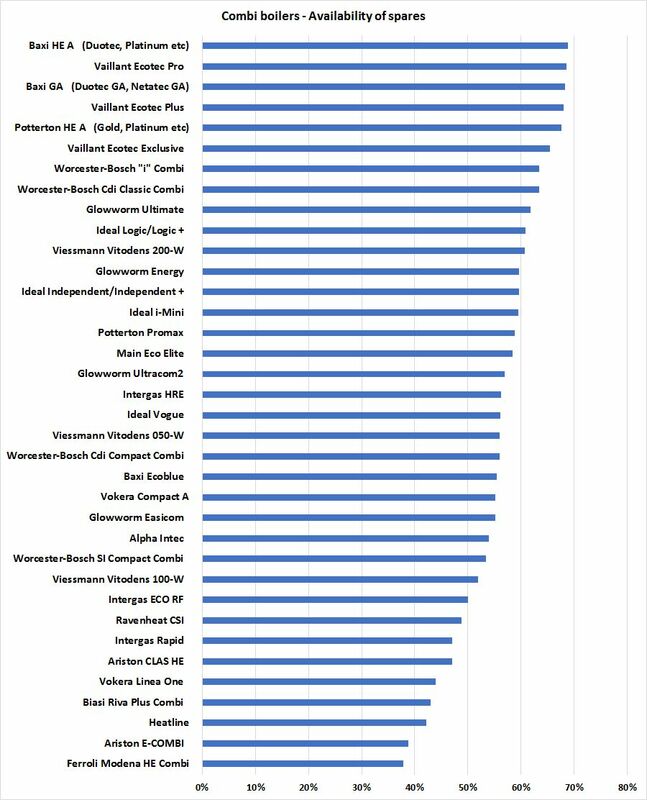 Above, we asked whether spare parts were value for money, and as expected, no manufacturer scored particularly highly. Only the Glowworm Energy managed to score above 70% with a 72% score. Next was the Intergas HRE SB model at just under 69%. Our next question was based on which was the best value overall heat only boiler. We asked what the best boiler was based on price, quality, warranty and any other factor they thought was important. The Intergas HRE SB and the Glowworm Energy took first and second place in this category with scores of 89% and 85% respectively. Baxi, Ideal, and Vaillant take the next three places with their models. The next 5 boilers all hovering around the 70% mark. There’s a lot of choice in this category because so many manufacturers offer an entry-level boiler. Percentage differences will be very small. Even so, Ideal do really well again with more than 11.5% of votes. Main’s Eco Elite was in second, and the only other boiler to manage a double-digit score. Glowworm was in 3rd place and Heatline in 4th. At 16%, Ideal is a clear and deserved winner of this category. Baxi’s Ecoblue is also well rated by engineers. Vaillant’s Ecotec Plus completes the top 3. Glowworm takes 4th. 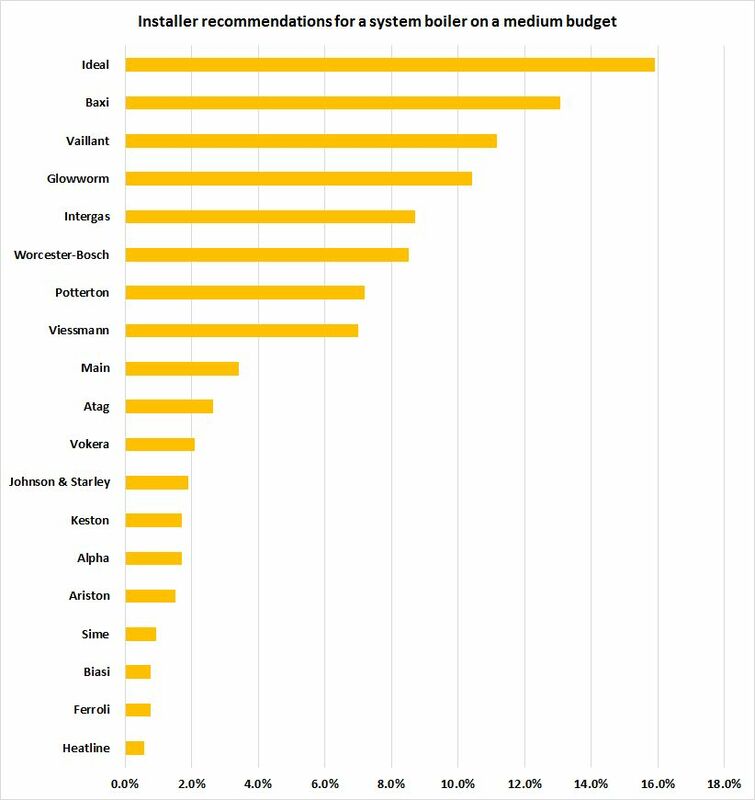 These 4 manufacturers account for more than half the engineer recommendations. 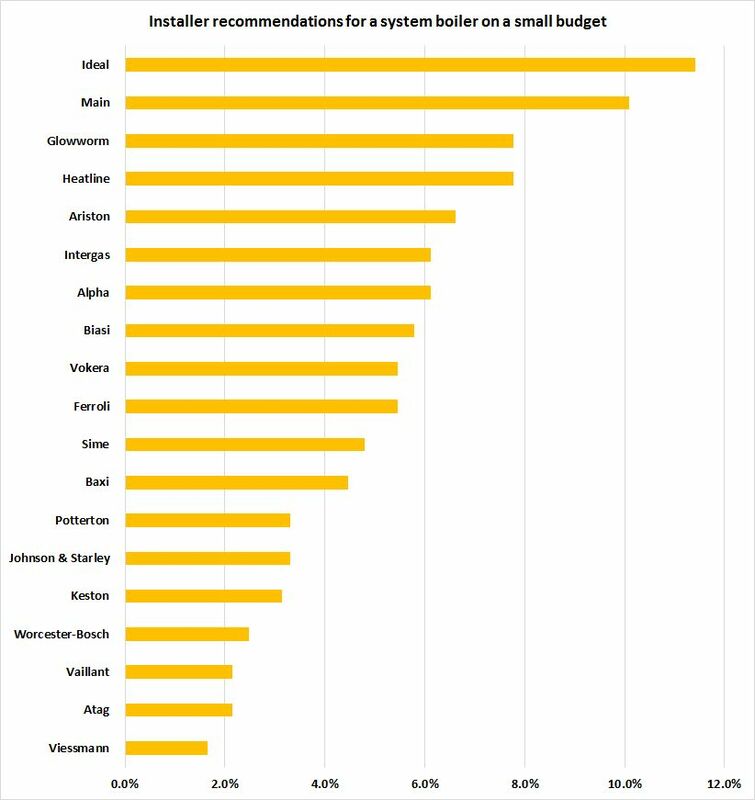 Market leaders Worcester and Vaillant back in their familiar positions leading the rest in the ‘money no object’ engineer recommendations. Between these two giants of the boiler industry, they account for 54% of all the votes cast. Viessman takes 3rd with 9.9% – I expected a little better from a very good boiler. Next, we asked questions on individual boilers that could help to back up the findings for system only boiler recommendations. It also helps us to determine which aspects of a boiler the engineer likes. 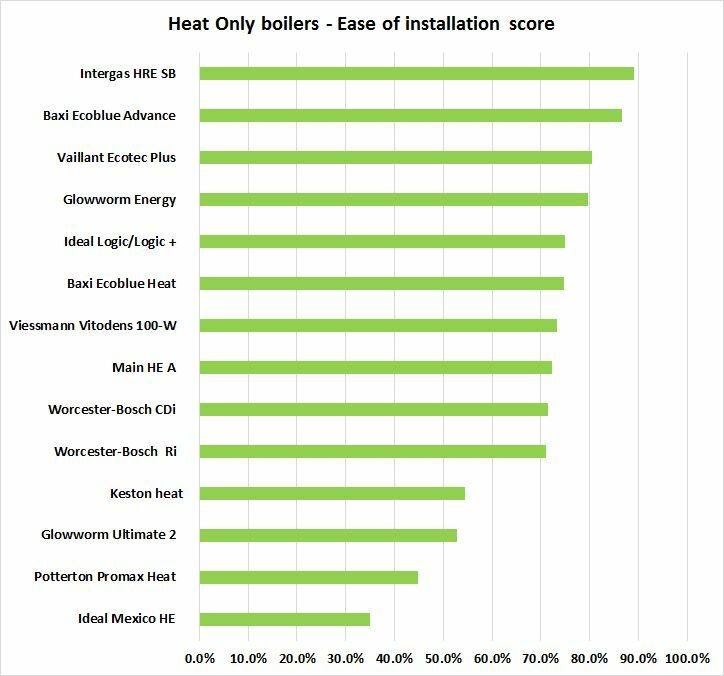 It’s desperately close at the top with the Ideal Vogue, Vaillant Ecotec Plus and the Intergas HRE all scoring around the 83% mark. Only a few percentage points separated the 3 of them. The Viessman Vitodens 100-W and the Glowworm Energy also deserve a mention scoring 79% and 78.8% respectively. Intergas winners again for this category, scoring 92%, four percentage points more than Vaillant with 88%. 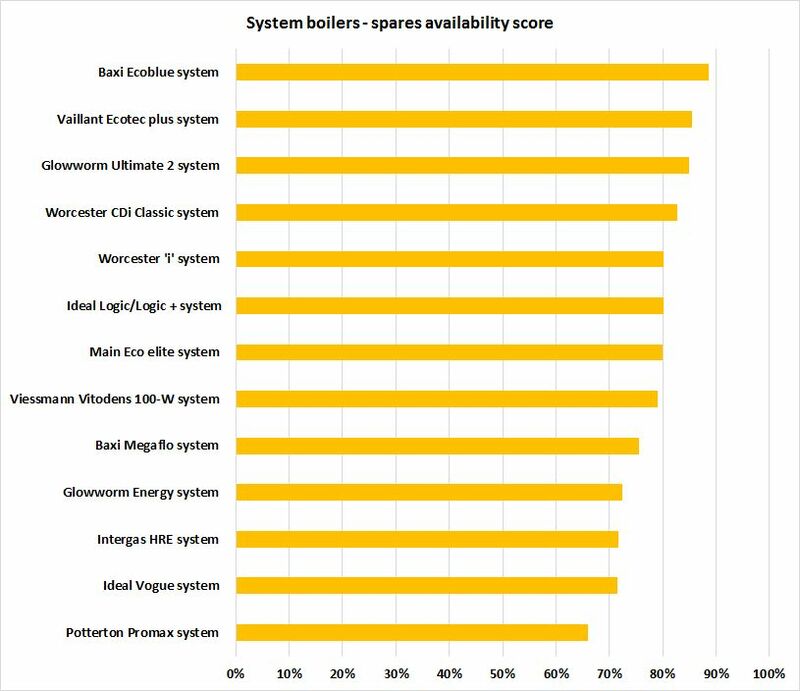 The top 6 boilers all scored above 80% for their build quality which suggests there’s good choice for the consumer when it comes to a system boiler. We asked each engineer how easy it was to work on these boilers when they service or repair them. Intergas scored an amazing 95% for this question. That’s simply because the boiler has so few parts inside it and it’s really well put together. The majority of boilers scored more than 70% which I’m happy to see. Well done all. 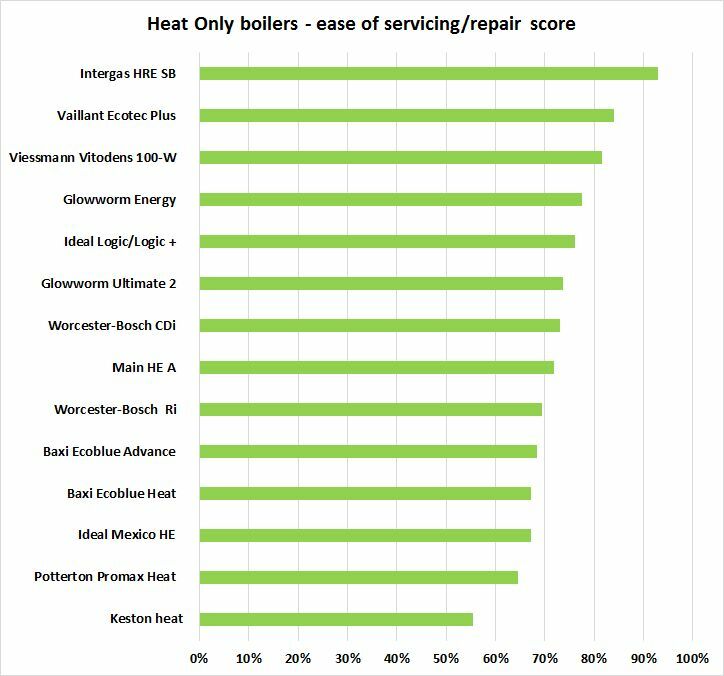 Two boilers scored lower than expected here, the Intergas HRE and the Ideal Vogue scored pretty poorly considering their other scores further up the survey. The winner of this section was Baxi’s Ecoblue boiler with 89%. The next 7 boilers scored around the 80% mark making them all winners in this category. Far and away the leader here is the Baxi Ecoblue boiler again. It scored 80% compared to the next highest which was the Vaillant’s Ecotec Plus model at 71%. Worcester, with it’s CDI range, narrowly beats Intergas’s HRE range into 3rd place by just 0.1%. The next 5 boilers are pretty similarly rated. 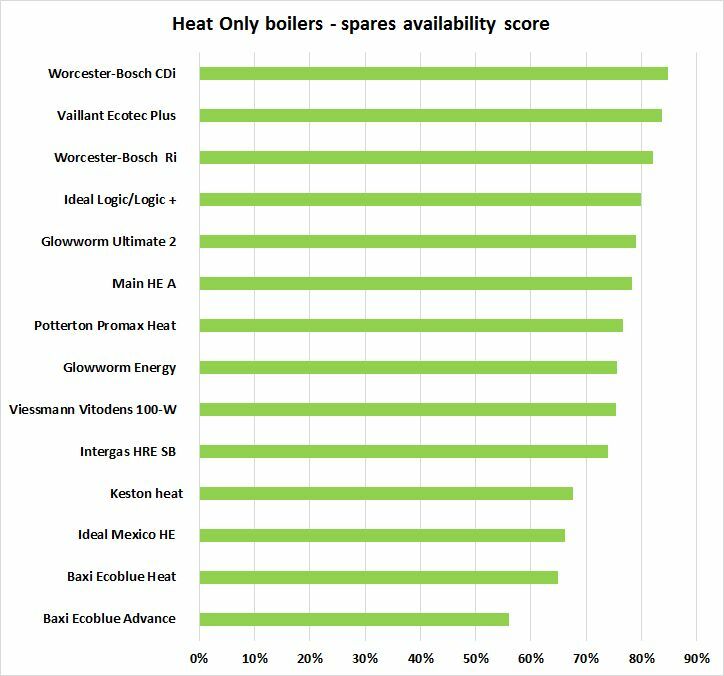 Most boilers score less than 70% which indicates that while spare parts are easy to obtain, they aren’t priced very fairly. Yet more proof, if any were needed, that manufacturers are charging too much for replacement parts. Our next question was based on which was the best value overall system boiler. 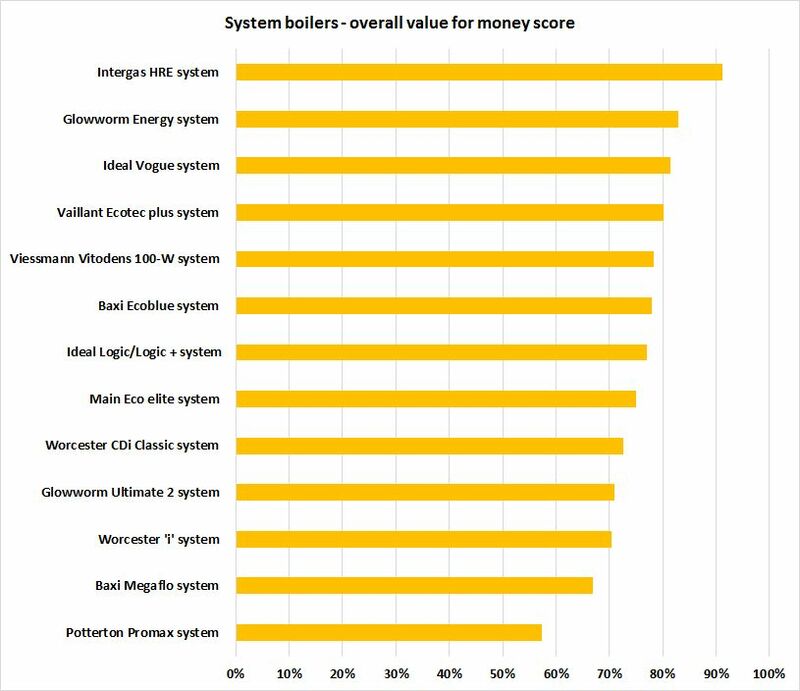 We asked what the best boiler was based on price, quality, warranty and any other factor they thought was important. The results were, by now, pretty expected. Intergas on top again with a score of 91%. The Glowworm Energy, Ideal Vogue and then Vaillant Ecotec Plus take 2nd, 3rd, and 4th respectively. That was pretty much it for the questions. Firstly, it was a huge survey involving hundreds of engineers whose help and insights we are very thankful for. 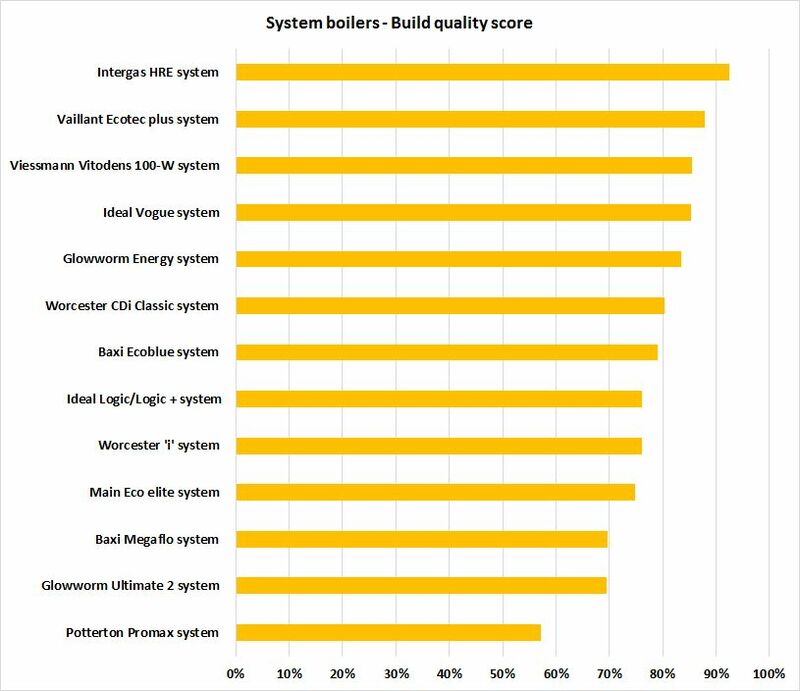 You’ve helped finally answer the question: Which is the best boiler? So, let’s look at the winners more closely. For recommendations, Ideal placed 1st in all medium budgets for combi, heat only, and system boilers. They also placed 1st in the small budget for combi and system boiler, with Main taking 1st in the Heat only range. Main also took 2nd place for best system boiler and best combi boiler. In the individual categories, the Ideal Vogue deserves a special mention – it scored well for ease of install, value for money and build quality. Ideal probably wants this boiler to compete with Worcester and Vaillant but it probably sits better in the mid-range to upper market. Ideal do not manufacturer a heat only boiler so that’s why they didn’t have any say in that market. Intergas also deserve a mention. We don’t install them because they’re new to the UK market and, as yet, unproven. We don’t doubt they’re well built, easy to service and easy to repair. The placed 11th in the budget combi recommendations but ignoring that result, their average position was 5th. Only Ideal did better. Atag, also a relatively new entrant to the UK market, didn’t get enough of a mention for us to include them. They have very good boilers and it will be very interesting to see how they do in next years survey. 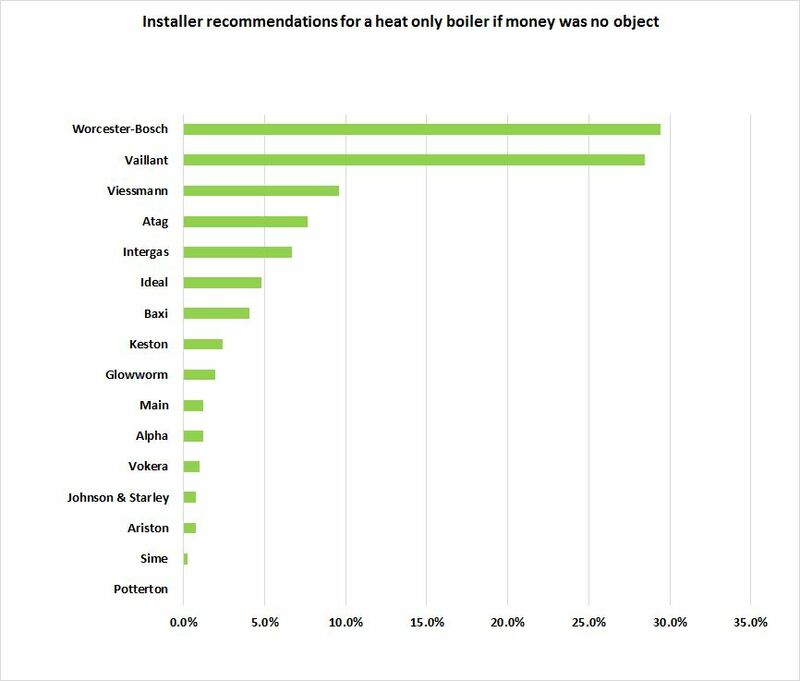 Worcester and Vaillant were the best of the best when it came to the top end of the market and easily won the money no object recommendations. Both also scored highly for pre-sales, ease of installation, build quality and ease of servicing. Importantly, Vaillant also had more recommendations in the medium budget market. This, to me, suggests that their boiler is probably the best value boiler on the market. Amazing survey!! Thankyou so much for going to the trouble to do this. Would love to see one for 2019, just to see how Intergas’s new Xtreme and Xclusive Combi Boilers fare.. Thanks again guys. A job well done! !